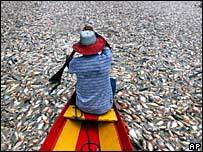 Two years ago the world was shocked by pictures of hundreds of rotting fish floating in the world's largest river. Stranded villagers stared in bewilderment at dried out banks, and helicopters delivered food and water to isolated river communities. They were the images of the widespread drought in 2005 in the Amazon - an area of lush rainforest in most people's imagination. It was the worst in some areas since records began, and prompted the Brazilian government to declare a state of emergency. Nearly two years on, the world may have forgotten the drought, but the scientific community has not. Meeting at Oxford University this week, many of the world's leading experts on climate change and Amazonia have been grappling with issues critical to the future climate of the world. Did global warming cause the drought? How likely is it that such droughts will be repeated in a warming world? And just how much devastation did the drought cause? There was broad consensus that the 2005 drought was linked not to El Nino - the periodic phenomenon which begins with a warming of waters in the Pacific - as with most previous droughts in the Amazon, but to warming sea surface temperatures in the tropical North Atlantic. Peter Cox, professor in climate change dynamics at the University of Essex in the UK, thinks the same factors which caused the drought are likely to be repeated. What drives it, he says, is the warming of the North Atlantic Ocean in the Tropics relative to the South - this causes less rain to fall. So how often could such droughts happen? The Hadley Centre climate change model predicts that, under current levels of greenhouse gas emissions, the chances of such a drought would rise from 5% now (one every 20 years) to 50% by 2030, and to 90% by 2100. "We can't say for sure that any individual drought such as the one in 2005 is caused by global warming," says Mr Cox. "But we can say the probability of such an event will increase as a result of human-induced climate change and could be very common indeed by the end of the century." The Hadley Centre model is one of several global climate models (GCMs) attempting to predict weather changes in the Amazon. It is best known for warning of catastrophic losses of forest in the Amazon over a period of decades known as "forest dieback". Other models show very different patterns of rainfall over the Amazon, but experts at the conference regard the Hadley model as one of the more robust. "The Hadley Centre model does a credible job," says Carlos Nobre, the Brazilian chair of the International Geosphere-Biosphere programme. "What all the GCMs predict is much greater variability in the weather, and the Hadley model captures that well." There is less uncertainty about the impact and the unusual nature of the 2005 drought. "It was very atypical in its location and intensity," says Mr Nobre. "Most Amazonian droughts occur in the north-eastern Amazon, but this one started in the west and south-west, and its impact spread as far as the centre and east." Downstream in the city of Manaus, the Amazon's level dropped three metres lower than average. Many communities dependent on the river for transport were left stranded as tributaries dried out. For the first time, a very large spread of forest fires was recorded in the south-west region. New research by Luiz Aragao at Oxford University's Environmental Change Institute shows the extent of the fires. "An area of 2,800 sq km (1081 sq miles) was lost due to an extensive leakage of fires into newly-flammable forest," he says. That is an area more than 1.5 times the size of Greater London. Mr Aragao's research shows the fires occurred mainly where there was human activity which could ignite them. In other areas affected by the drought where there are few humans, such as south-eastern Peru, there was little evidence of any fires. The more alarming predictions for the Amazon say the combination of forest fires, drought, deforestation, changes in land use (such as soya production) and global warming will combine to push the Amazon over a "tipping point" into a cycle of destruction. However low the probability, changes to the Amazon are likely to be a 'high impact' event on the world's climate. Scientists at the conference were keen to stress they do not know the risk of this occurring, but talked instead of "corridors of probability". There is disagreement over these corridors. "The Hadley Centre model predicts it is very likely indeed that the Amazon will be severely impacted by climate change over the next few decades," says Professor Cox. "But if you take all the models, then maybe a 10 to 40% probability is more defensible." But however low the probability, changes to the Amazon are likely to be a "high impact" event on the world's climate. As one conference speaker pointed out: "You wouldn't get on a plane if you knew there was a 10% chance of it crashing."